1 To celebrate everyday heroes who are making the world a better place for all of us. Each time an Awesome Award is presented or changes hands, it creates happiness, connection and bonding. It also creates an opportunity for a story to emerge and be captured, and it’s these optimistic stories, the ones Pete Seeger referred, that offer inspiration and hope for change. We used to believe that change would come from one big story, one massive new narrative that was so grand and compelling that it would simply force us to change. But what we’ve learned is that change comes via hundreds of small stories of hope, generosity, creativity, reciprocity, service, friendship, integrity, dedication, family, community and love. These stories and people remind us of what is possible and of the world we want to live in. They remind us that the potential for a better world already lives within each of us. So consider the stories that you want to hear, the everyday heroes in your community that you want to believe in, and nominate them. 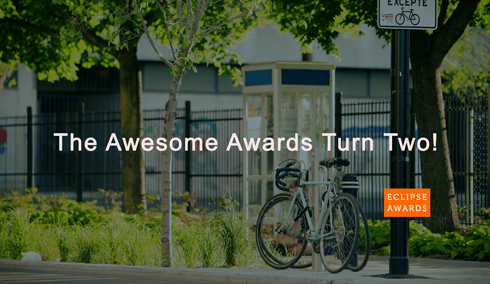 The Awesome Awards offer a chance to share their story, to appreciate the qualities that you admire and respect, to celebrate the good people who are making the world a better place for all of us. We hope they will be around for decades to come, spinning their magic wherever they go! This is positive change through community, love and appreciation. Onwards good people!